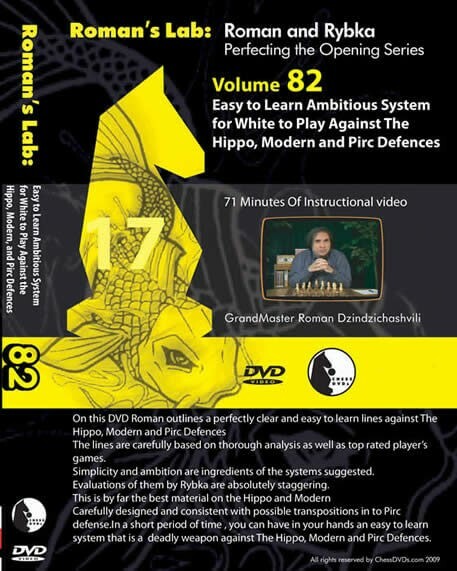 On this DVD, Roman outlines a perfectly clear and easy to learn lines against The Hippo, Modern and Pirc Defences. The lines carefully based on thorough analysis as well as top rated player's games. Simplicity and ambition are ingredients of the systems suggested. Evaluations of them by Rybka are absolutely staggering. This is by far the best material on the Hippo and Modern Carefully designed and consistent with possible transpositions in to Pirc defense. In a short period of time , you can have in your hands an easy to learn system that is a deadly weapon against The Hippo, Modern and Pirc Defences.